WHEN SHOULD I PUT THE THUNDERSHIRT ON MY DOG? One of the most common questions that we get here at Thunderdogs Malaysia is "When should I put the Thundershirt on my dog?". For most dogs, the Thundershirt will help reduce, if not eliminate, their anxieties completely from the first use. It is recommended that the Thundershirt be put on at least 15-30 minutes prior to an event which causes your dog to be anxious. This helps keep your dog calm before the event and prevents your dog from getting into a severely anxious state which causes your dog, and you, a lot of unnecessary stress. For example, for thunderstorm anxiety, put the Thundershirt on as soon as you see the first signs of a storm approaching - slightly darker skies, a faraway rumble. Do not wait for the storm to begin! However, you should still see significant results even if you put the Thundershirt on after the storm has started. A second example, for separation anxiety, put the Thundershirt on well before you leave the house. This will put your dog in a calmer state of mind before you and to prevent your dog from associating the Thundershirt with you leaving! 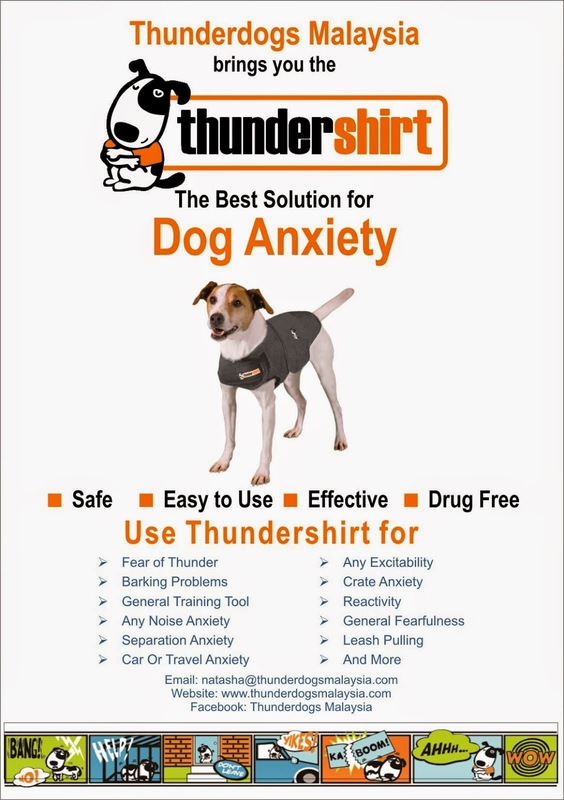 For dogs with severe anxiety issues however, the Thundershirt may have to be used as part of a behaviour modification programme. Please refer to our Training Programme section for additional information. Additionally, we also recommend that you put the Thundershirt on dogs with severe or multiple anxiety issues 24/7 for at least a week or two. It is also highly recommended that you let your dog sleep in their Thundershirt. We are of the opinion that the Thundershirt promotes better sleep for your dog which in turn means that they would be calmer during the day. Gradually reduce the amount of time that your dog wears the Thundershirt as she improves. The Thundershirt can also be used to help comfort dogs that are sick or recovering from an illness or surgery. 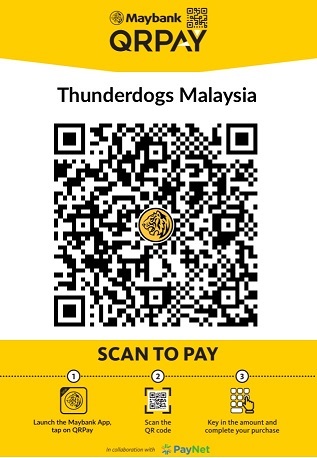 Thunderdogs Malaysia has used the Thundershirt on some of our rescued dogs that were terribly sick and we are happy to report that they recovered much quicker than anticipated by the vets. Please do email us or leave a comment on this page if you have any further questions regarding the Thundershirt and how to use it. We hope that this post has been helpful to all of you and your dogs. The monsoon season is here with rain and thunderstorms hitting us every day. While most people have to deal with horrific traffic jams, many of us dog owners have a more stressful situation to deal with - our dogs. Unfortunately, not all dogs keep their cool during the rainy season, and some get into severe anxiety attacks when it storms. Thankfully, there is a now a safe, drug free and easy to use tool to help dogs keep calm during rains and thunderstorms, i.e. by using the Thundershirt. Please use the following sizing guide to determine the size required for your dog. Payment information will be provided upon receipt of your order. Your Thundershirt will be shipped to you within 5 working days of receipt of payment via PosLaju. Therefore please ensure that there is someone available to collect the Thundershirt at the address provided. Note: If you require a size that is not listed above, e.g. XXS or XXL, please drop us an email with your dog's chest measurement and we will obtain the size you require. However, please allow 3-4 weeks for delivery of sizes that we do not stock.